This book can change your life and includes inspirational prayers, tools to help you forgive, tools to help relationships, law of attraction, and body mind spirit healing. Are you interested in a book that will change your life? View large images of the front and back cover. Read Chapter Two: Appreciate Everything. Read tips for doing a 40-HOUR Prayer instead of a 40-DAY Prayer. 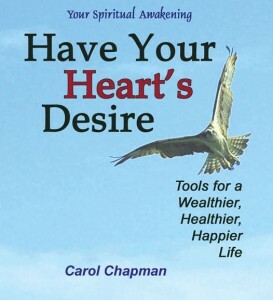 Have Your Heart’s Desire: Tools for a Wealthier, Healthier, Happier Life is a book that teaches some of what Carol has successfully used in her own spiritual journey. Carol has already shared the prayers, or meditations, in Have Your Heart’s Desire at her speaking engagements. Audience members have frequently remarked that the prayers have improved their lives. The suggestions in Have Your Heart’s Desire have been used as healing prayers, to gain spiritual guidance, to forgive others as well as oneself, to release anger and resentment, and as manifestation prayers that use the Law of Attraction while honoring the will of the soul. This book also shows how to choose words to create more powerful prayers and meditations. Carol learned the prayers from their creator, J. Everett Irion, a kind and psychic counselor who was working at Edgar Cayce headquarters in Virginia Beach. Irion studied the psychic guidance in the Cayce readings and provided private spiritual coaching sessions that included guidance in psychic development, personal transformation, and self improvement. One of the prayers, the profound 40-day Forgiveness Prayer, is often referred to as the Edgar Cayce prayer. If you want to make a better life, Have Your Heart’s Desire is for you! “I’ve read almost all your book, and I think it’s wonderful. Anybody who reads it, would probably be inspired to try some of those techniques. And I recognized all the same things Everett used to tell me too, and I’m sure all the other folks who asked him about anything, for example: Say “thank you” for everything, etc. Your personal examples of results, wanted and unwanted, are so helpful and encouraging. And your not telling people who their God or higher self should be—that makes it so universal. I don’t mean to sound like a book review, but just telling you how much I like and respect this book. “It would be a super Christmas gift and it would also be a super e-book for those electronically inclined people. Have Your Hearts Desire is the first book in the “Your Spiritual Awakening” series, a series devoted to sharing the tools that have helped Carol develop her spiritual abilities. This particular book presents inspirational prayers that she has shared at her speaking engagements. Audience members have frequently remarked that the prayers have improved their lives. Now these prayers are being shared with the rest of the world so that others can reap the benefits the prayers provide. 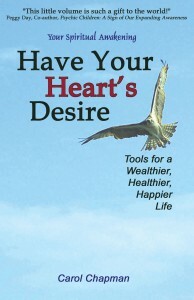 Have Your Heart’s Desire: Tools for a Wealthier, Healthier, Happier Life (ISBN-10: 0975469134, ISBN-13: 978-0975469132, ASIN: B006S8F2KG, SunTopaz, 124 pages) contains an appendix, bibliography, and a foreword by Nancy C. Christbaum. The paperback also has an index. Have Your Heart’s Desire is available in paperback and Kindle formats from Amazon in most countries. The paperback is also available from many other online retailers as well as select bookstores. If you are ordering it from a bookstore, you will need the 13-digit ISBN (978-0975469132). In the U.S. from Amazon.com as a paperback or Kindle. In the Canada from Amazon.ca as a paperback or Kindle. In the United Kingdom from Amazon.co.uk as a paperback or Kindle.